Before we start this week, this column would like to pay tribute to the man who inspired its name. André Previn, who died last Thursday at the age of 89, was a noted musician and conductor who won four Oscars, eleven Grammys (one of which was for lifetime achievement) and an honorary KBE, and left behind a huge collection of recordings and compositions; but for British people of a certain age he will be forever remembered for that sketch in the 1971 Morecambe and Wise Christmas Show, in which “Andrew Preview” conducted Grieg’s Piano Concerto by Grieg. Andrew’s Previews would like to thank the original “Mr Preview” for all that entertainment. Aylesbury Vale council, Buckinghamshire; caused by the death of Conservative councillor Michael Edmonds at the age of 82. A veteran of local government, Edmonds was first elected to Aylesbury Vale council at a by-election for Stone ward in May 1975; he had a break in service from 1987 to 2003 when he returned as councillor for Long Crendon ward, transferring to this ward following boundary changes in 2015. Edmonds also served three terms on Buckinghamshire county council, in 1977-81 and 2005-13. His highest local government office was as deputy leader of Aylesbury Vale council from 2007 to 2013, and since 2014 he had chaired the council’s strategic development control committee. As can be seen, Michael Edmonds’ local government career almost spanned the entire lifetime of Aylesbury Vale council; it held its first election in 1973, took on its responsibilities in April 1974, and looks likely to be abolished in 2020. As part of that the May 2019 elections in Buckinghamshire have been cancelled, and if there are no further vacancies this will be the last time that an Aylesbury Vale by-election appears in Andrew’s Previews. Edmonds’ ward was Haddenham and Stone, a large rural ward of six parishes which fills the space between the Buckinghamshire county town of Aylesbury and the Oxfordshire town of Thame. The largest settlement within the ward is Haddenham, a rapidly-growing place with a commuter economic profile thanks to its location on the Chiltern railway line. Haddenham and Thame Parkway station has seen patronage grow by over 26% in the last five years, and with regular trains to London, Oxford and Banbury together with bus links to Thame and Aylesbury it is an important transport hub for the local area. Haddenham’s traditional industry was duck breeding, and its duckponds and picture-postcard “wychert” buildings have made it a favourite location for TV and film productions from Midsomer Murders to The Great Muppet Caper. Haddenham had a radical political tradition back in the day, and as late as 2003 the Haddenham ward split its three seats between the Lib Dems, the Conservatives and an independent. However, the Tories got a full slate in 2007 and haven’t really been challenged here since. 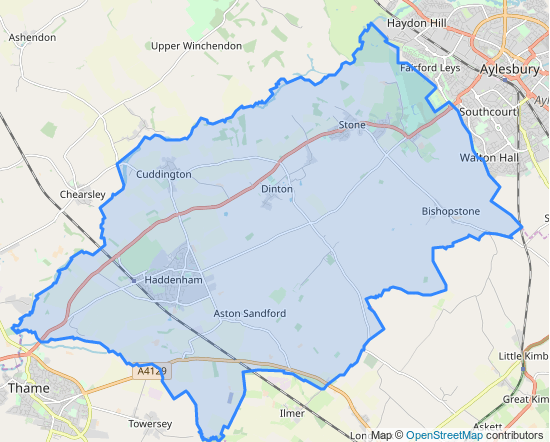 Boundary changes for the 2015 election added the parish of Cuddington to the ward’s area and the village of Stone to its name; Stone lies just south-west of Aylesbury, in the shadow of the Chiltern escarpment. That 2015 poll returned the Tory slate with 41% of the vote. A three-way pileup for second place was won by the Greens’ David Lyons (who was a long way ahead of his running mates) ahead of independent candidate Mark Bale and the UKIP slate; Lyons, Bale and UKIP all polled 16%. David Lyons went on to be runner-up to the Conservatives for the Bernwood county division, which includes Haddenham, in the 2017 Buckinghamshire county elections; he scored an impressive 31% to the Tories’ 47%. Stone is part of the Stone and Waddesdon county division which the Conservatives very easily gained from UKIP that year. The ward does not have party political contests at Parliamentary level, as it is part of the Buckingham constituency held by Speaker Bercow. Defending for the Conservatives is Mark Bale, who as stated polled well as an independent candidate for this ward in the 2015 election; Bale is a Stone with Bishopstone and Hartwell parish councillor, was once a farmer and now runs a business selling and repairing computers. Returning for the Green Party is David Lyons, an engineer in the railway industry and Haddenham parish councillor; he is an organiser for Haddenham in Transition, which is an initiative to increase the village’s self-sufficiency in a world which in years to come will slowly wean itself off its oil dependency. In 2011 Lyons was instrumental in having Haddenham recognised as a “transition town”. UKIP have not returned, so completing the ballot paper are Liberal Democrat Jim Brown and Labour candidate Jennifer Tuffley.